Implement the Pay Transparency Act, 2018 and the new supporting regulation no later than May 1, 2019. This will provide employers with a year to organize reports – a reasonable length of time considering that employers already have this basic payroll information at their fingertips. In the United Kingdom, 82% of employers and business organizations agreed that the publication of gender pay information would encourage employers to close the gender pay gap. Keep the $2 per hour Provincial Wage Enhancement Grant for Registered Early Childhood Educators and child care workers working in licensed child care. Increase funding for investment in public and not-for profit licensed child care. Ensure that broader public sector employers are funded appropriately to meet their pay equity obligations and demand accountability to demonstrate that pay equity payments are being made to workers. Increase funding to the Pay Equity Commission to enable robust proactive enforcement of pay equity obligations. The Commission’s own studies found that 54% of employers are not compliant with the Pay Equity Act. Pay equity is the law. Compliance is mandatory and must be rigorously enforced. 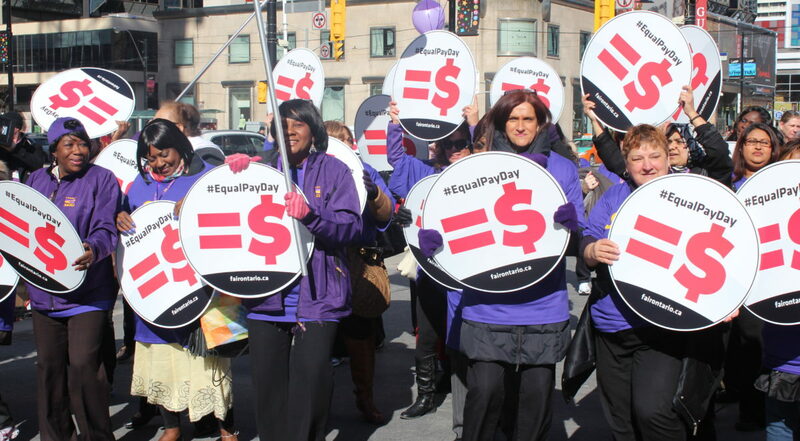 As part of the new enforcement regime, the Pay Equity Commission must mount an immediate public campaign to advertise the rights and obligations under the Pay Equity Act. Raise the minimum wage to $15 per hour immediately and increase funding for proactive employment standards enforcement to end employment standards violations that impoverish women.